The Rams and the 49ers actually managed to put on a great, high-scoring game on Thursday Night Football. Here are some of the highlights. 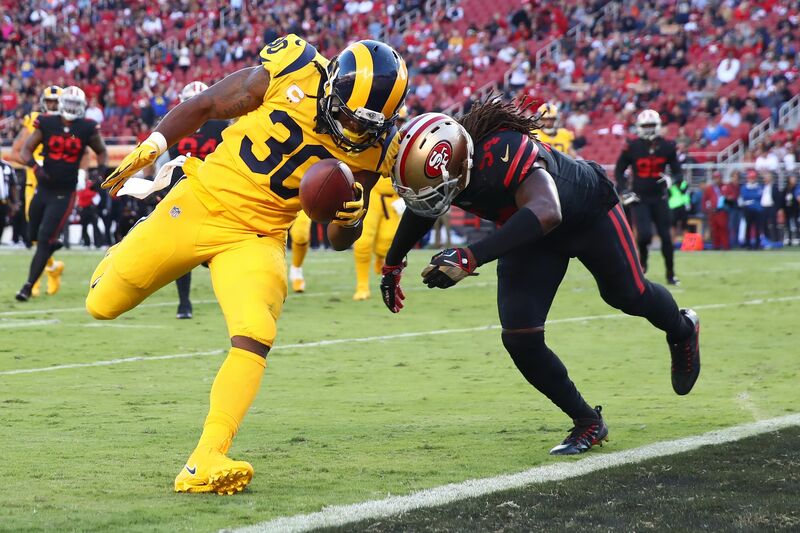 Somehow, some way, the Los Angeles Rams and the San Francisco 49ers put on the greatest game of football ever played, and it came on Thursday Night Football with Color Rush uniforms filling the field. The Rams pulled off a 41-39 win, but it did not come easy in the fourth quarter for the team as they saw a huge lead fall apart on some crazy catches and forced fumbles from the 49ers late in the game to keep things interesting. In the end, the Rams defense saved the day, and stopped the 49ers from any potential comeback at home. This one was an absolute lock from the start when Gurley scored his first touchdown less than 20 seconds into the game. He had three touchdowns in the first half alone, and put on an incredible performance both in the air and on the ground that Rams fans should be very happy with. It looks like Gurley’s back at the pace he set in his rookie season, and that’s a good sign for the Rams this season. Watkins finally found himself as a piece of the action on Thursday night, but was unfortunately overshadowed by Gurley’s huge game on offense for the team. Watkins scored his first two touchdowns with the Rams on Thursday night, and his second on the night was an impressive effort to get past the goal line and help put in a nice dagger in the fourth. He’s finally gaining some chemistry with Goff, and could be in for a big year in 2017. Goff has had a solid first three weeks of the 2017 regular season, and it looks like he’s finally settling in under center for the Rams after his mediocre rookie season. He’s turned the team into a contender in the NFC West to start the year, and he’s a lot more calm and collected leading the offense than we previously saw from the young stud. The Rams were favored -2, according to SportsBook Review, and the books somehow nailed it right on the head with the Rams pulling out the 41-39 victory on the road. The Rams will have a potentially huge matchup with the Dallas Cowboys in Week 4 on the road to look forward to after a long break in between games, while the 49ers will look to bounce back once again against the Arizona Cardinals on the road.